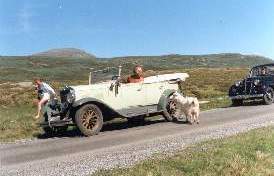 Bought by Gerhard K. Aspaas (glazier) from car salesman Hattrem in Trondheim on May 16th 1929. Used by the owner and his private chauffeur until he died in 1946. 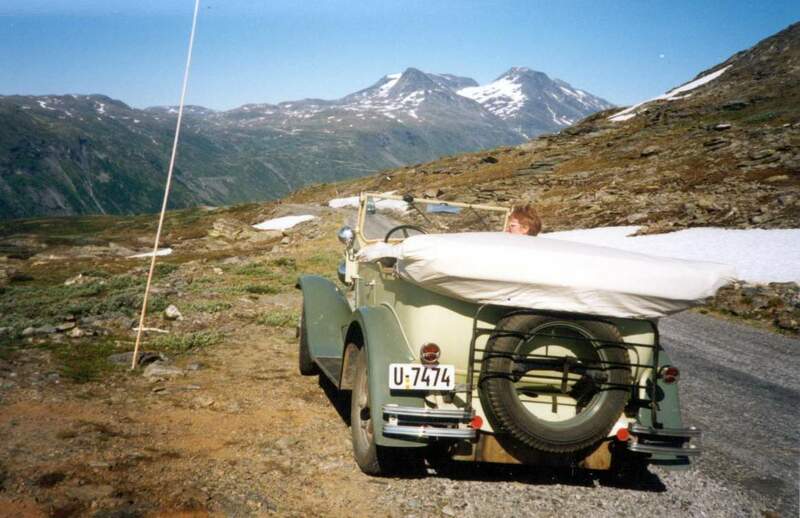 The car was then stored (like all the other cars) during WW2. Used only one time in 1946 (no gas to buy without license from the car department the first years after the war, and I have found the "gas license paper" from 1946 in the car).From 1946 the car was stored in a garage close to a cabin 15 miles outside Trondheim. 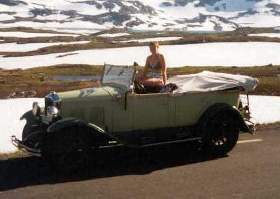 I have a 1928 Ford A touring car that I have used as my "good weather summer car" since 1964. On a pretty day in 1966 while at my parents cabin 5 miles from the "Durant cabin" when schoolchildren came to my car and told me: "we know of another old open car in the garage close to our school!" To make a long story short, the garage doors had not been open for many years; trees of about 10 - 12 feet had grown up outside the garage doors. The children showed me the way into the garage (big hole in the roof! ), and there I found the Durant. I spent nearly one year talking to the widow before she sold me the car. Due to the long storage in a run down garage, lots of rain and snow had damaged the roof. It made a big restoration job before the car was running again. Having towed the car home, I started looking at it. Because of the run down garage, most of the wood frame had rotted away. The engine had water in all cylinders and in the oil pan, the leather in the seats and the door panels, the convertible top (not the frame!!!) were all decayed, the front window was broken, the instruments were destroyed, the chrome plated parts were red due to rust, I found some (not much) rust in the body and a lot of other things were defect. I therefore started looking for Durant 66 (spare) parts. 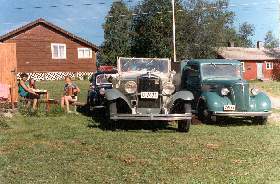 I was nearly catching a 4-door sedan as "spare parts car", but a Swede bought it 2 hours before I arrived at the home of the farmer who had it. At that time I knew an old car parts dealer, and he told me that his old friend (Hattrem) only had sold 3 of the 66, 2 cars of 4-door sedans and my open car. He said, You'll never find one part in Norway, even I don't have parts! Until today he had been right. I have not found one spare part, not even at big swap meets in Norway. 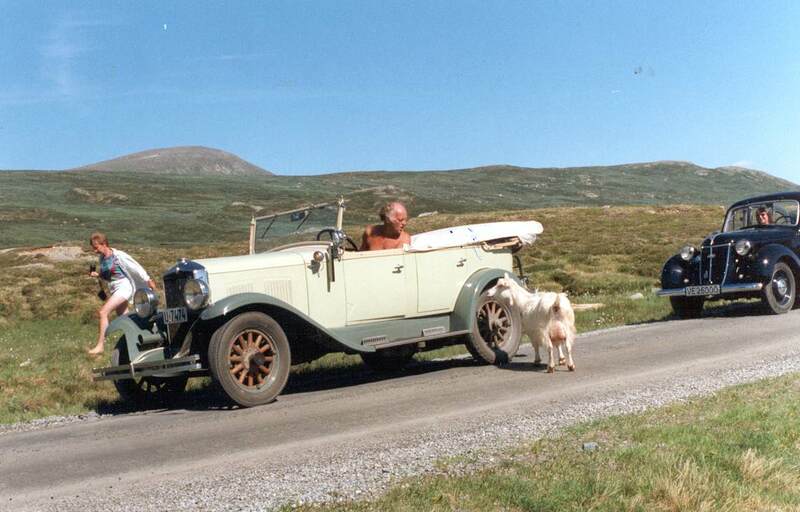 I therefore used my Model A Ford (which I still use very much) in the summer time and spent some more time restoring the Durant, since I already had one open "old-timer". After 2 - 3 years of storage outdoors under a car cover, I was successful in renting an indoor workshop place. 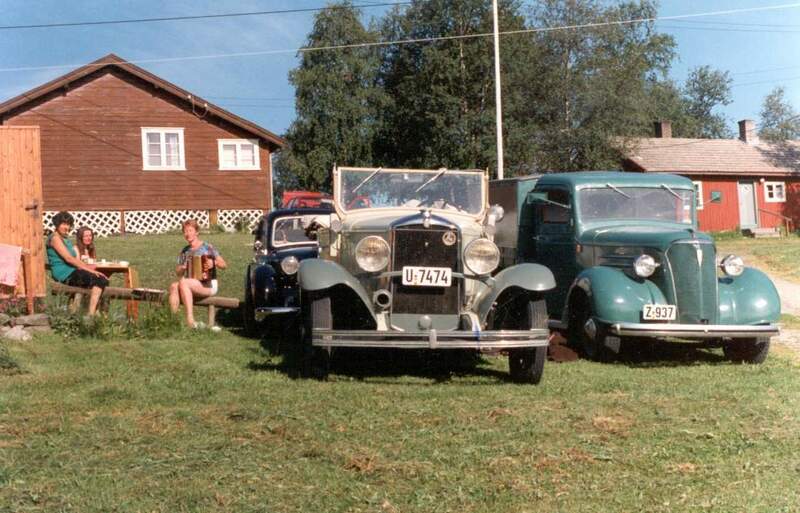 At that time I also bought a 1946 Ford Coupe as my "all weather summer car". I first made new wooden body frames and all other bad parts of wood. The engine was a big problem. Three of the cylinders had holes to trough the cylinder walls, the crankshaft was brown from rust outside and inside (in the oil channels), the oil pump likewise, the valves were like some warts and the cam shaft and the valve lifters were all very brown from rust. I went to an engine repair workshop. They bored the cylinders and pressed new "dry cylinders" in the holes. They put new steel (I don't know the American words for putting steel grains through a nozzle to "build" new steel surface) on the crankshaft, I made all valves new from standard valves on my lathe, and I restored the oil pump, the valve lifters and the camshaft myself. The old carburettor was stolen, but a friend in Felton, Minnesota bought a new standard carburettor for me. The carburettor runs well. I welded all the rust, made all the electrical wiring, made the overhaul of the brakes and the steering myself. I also did the painting (cellulose paint). 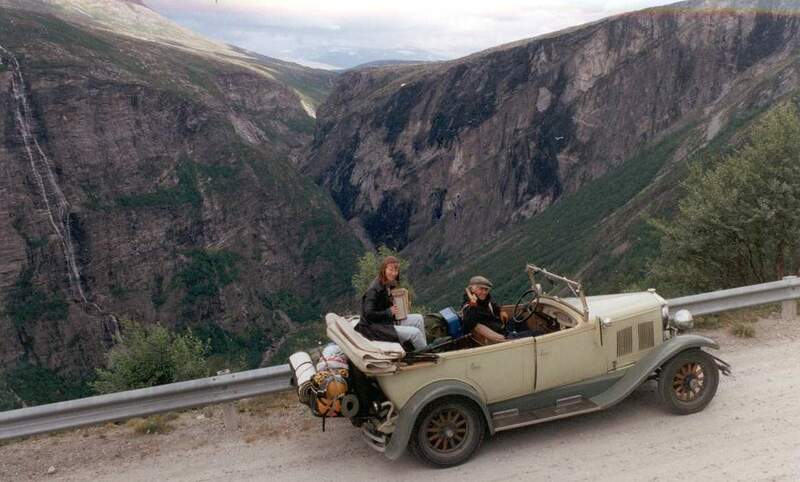 Once on a trip along the Swedish east coast in my 47 Ford, I met an old 34 Chevy Roadster driver. Talking together he told me he had a lot of old parts at home. There I found a complete and very pretty instrument panel for the 1929 Durant 66! An old friend of mine, a pensioned upholsterer who had upholstered my A-Ford some years earlier also knew the old Durant owner. He said: "I'll make all the upholstery on the car. I want to see it on the road soon". Because of the very high leather prices I had not enough money to buy leather, so he used leather like material on the seats. The top he used the best quality material, you know, here in this part of Norway we get 6 to 7 feet of rain a year! You know the 3 T's? I used nearly 18 years to restore my Durant to the condition you can see it now. It is not "over restored". 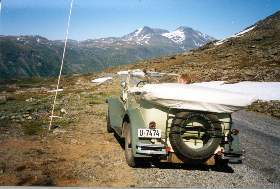 It is restored to be used, that is my way to make the old cars running again. 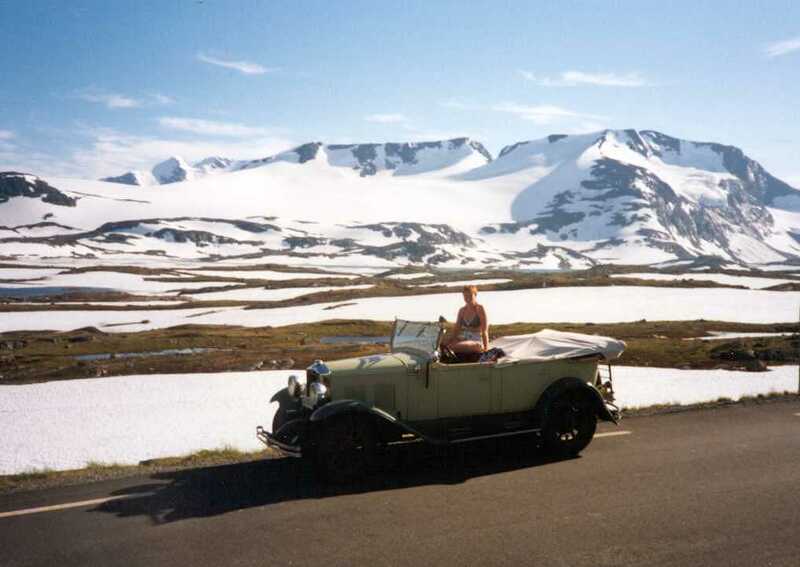 If anyone of you once in the future comes to Norway, you are welcome to visit my cars and me. The last time I visited the USA and California was in November 2001. At that time I didn't know about the Durant Club (sorry!). 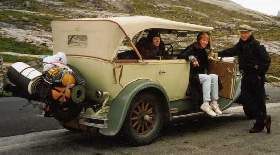 I have used the Durant mostly when the weather is fine, but some years ago we were 3 convertible cars, which went on a 9 days trip. In those 9 days we got an extremely bad weather with more than 6 feet rain! 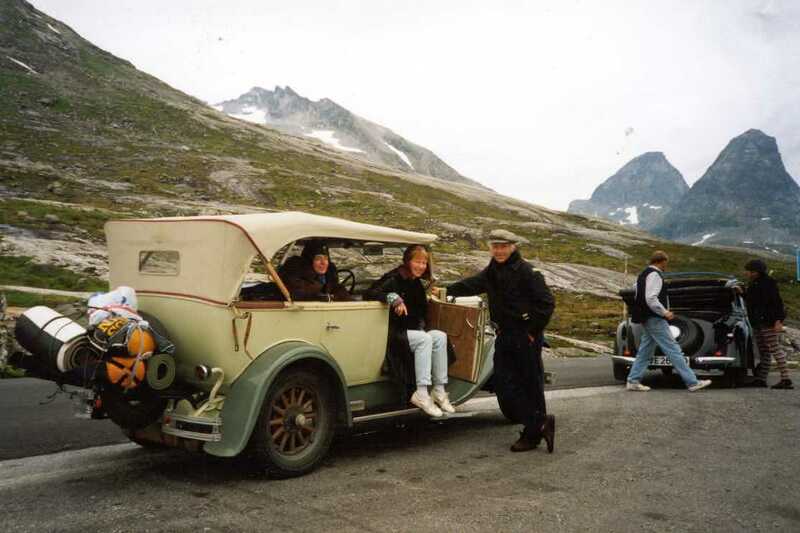 The -39 open Wanderer (German car) and a -31 Ford A Touring were more moist inside than outside, but my Durant was still dry inside after these 9 terrible days! This is the history of my 29 Durant model 66 Touring car; I hope you have enjoyed the story.